This year was the first year that I have properly celebrated World Book Day. For some reason, the past two-three years I cannot recall dressing up at my previous school's, and have always felt like we've missed out on the fun. This year KS1 had the idea for the teachers and teaching assistants to all dress as a coloured crayon from The Day The Crayons Quit by Drew Daywalt (crayon box included!) and it went down a storm. The children all recognised the story we were from straight away, and it was such a hit. 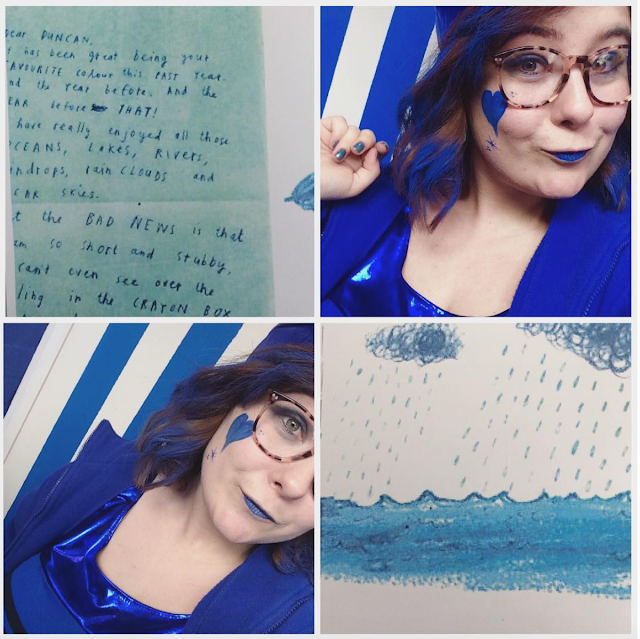 For the occasion, I also sprayed my hair with Bumble & Bumble spray chalk that I had lying around as I'd ordered a set with Blush & Lavender, so Cobalt was the spray I never thought I'd use until now! For World Book Day, our whole school had an assembly in the morning, where each year group stood up and showed their outfits. There were prizes for the most improved readers, and the headteacher read a story to the whole school. After, classes swapped for shared stories across year groups - my class went on a bear hunt (yes that fabulous story!). The rest of the day was spent writing descriptions of our characters and listening to our favourite stories. It was by far, my favourite day of the school year so far with characters like Matilda (wagon and everything! ), Willy Wonka (based on the headteacher's outfit from the previous year which made my heart swell!) and Funnybones walking into my classroom this morning!